Naturally this works best with Irish beef. But those who have no access to that should seek out a butcher who at least ages his or her beef for ten to fourteen days before sale. Prime ingredients are important for this dish. Pat the steaks dry with kitchen paper and season with pepper. Heat a cast iron frying pan or other heavy pan over high heat. When very hot, add the oil and butter. When the butter foams, add the steaks to the pan one at a time, and turn after 20-30 seconds to seal both sides. Lower the heat to moderate and complete cooking (3-4 minutes for rare, 4-5 minutes for medium, 5-6 minutes for well done). Leave each steak undisturbed on one side for half the desired cooking time: then turn. When finished, remove to warmed plates, and keep warm. Add the whiskey to the cooking juices. Be careful if you are cooking with gas, as the whiskey vapor might catch fire. If it does, lid the pan immediately to stop the burning. Scrape the pan with a spatula to loosen the nice burnt bits and dissolve them and the meat juices into the whiskey. Allow to come up to a boil and reduce for a few minutes, stirring and scraping all the while. Add the cream, lower the heat slightly, and allow to simmer for a few minutes and reduce further. Check the seasoning (you may find that you do not need salt for this dish: don't just season it without checking). 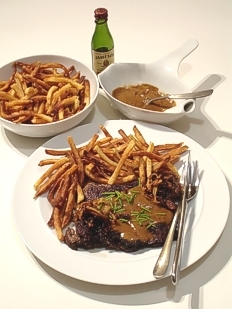 Having seasoned the sauce to taste, pour it over or around the steaks, as preferred, and serve immediately.